"Kill Or Become", the new video from Florida-based death metal veterans CANNIBAL CORPSE, can be seen below. The clip was directed by David Brodsky for MyGoodEye and was filmed on location at Kelly's Hideaway in Seffner, Florida. 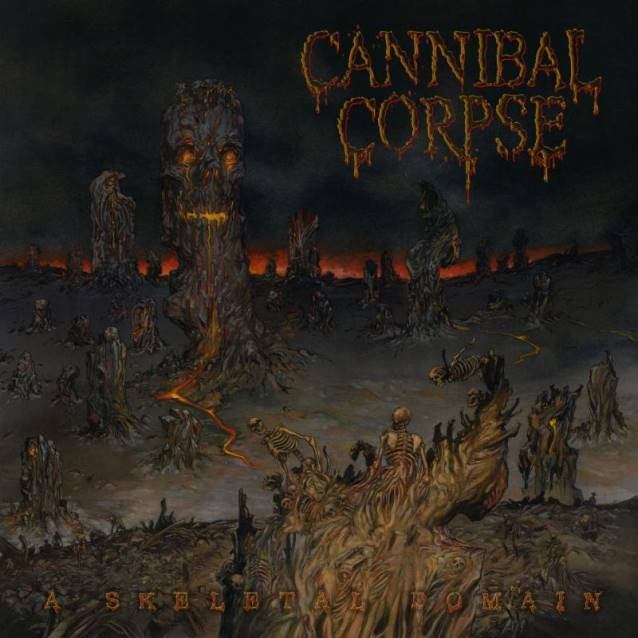 "Kill Or Become" is taken from CANNIBAL CORPSE's new album, "A Skeletal Domain", which sold 8,800 copies in the United States in its first week of release to debut at position No. 32 on The Billboard 200 chart. The band's previous CD, "Torture", opened with 9,600 units to land at No. 38. This figure was in line with the first-week performance of 2009's "Evisceration Plague", which entered the chart at No. 66. CANNIBAL CORPSE's 2006 CD, "Kill", debuted at No. 170 after shifting more than 6,000 copies. 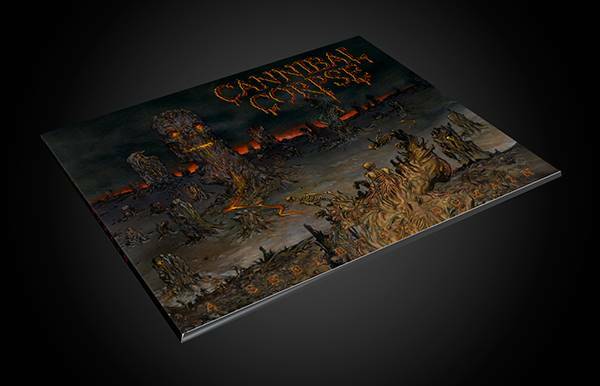 The CANNIBAL CORPSE collective — vocalist George "Corpsegrinder" Fisher, bassist Alex Webster, guitarists Pat O'Brien and Rob Barrett and drummer Paul Mazurkiewicz — approaches each recording session with a honed and precise vision of a band in their third decade of existence. With this new entry to their extensive catalog, they've switched gears, opting to work with producer Mark Lewis (THE BLACK DAHLIA MURDER, DEVILDRIVER) at Audiohammer Studios in Sanford, Florida, after having tracked their previous three outings ("Kill", "Evisceration Plague", "Torture") with Erik Rutan. Boasting twelve-ominous tracks in forty-four spine-fraying minutes, the result is a massive, belligerent, and deliberate aural attack that finds the band at their peak of their notoriously hyper-kinetic, meticulously executed brutality. Preparation for "A Skeletal Domain" did not vary significantly from previous efforts. "At the end of the day, we're still making a death metal record, no matter where it's being recorded," relays Webster. Mark Lewis offered a slightly different, modern recording approach, but the band stressed that they could not be more pleased with their previous albums with Rutan, and the door is most definitely open to work with him again in the future. Changing producers is something the band has historically done after every few albums, if only to not get too comfortable. CANNIBAL CORPSE also tried to step outside of their comfort zone when it came to songwriting and their musical performances. "Consistency is often confused with repetition. We are established with what we do as a band, and we could relax and not push ourselves, but we try to push the envelope. That's what makes this exciting," Webster adds. "Anyone who really listens to this album with an open mind will hear that it's not same-old same-old." Mark Lewis would concur with Webster's analysis and even goes a step further by claiming that "there are moments on this record that have never happened in musical history." Regarding the musical direction of the new CANNIBAL CORPSE material, Webster told Metal Wani: "I think it's… a dark-sounding album. Which, you know, it's a death metal album, so, of course, it should be kind of dark and eerie sounding anyway, but I think this one a little more than normal. That was kind of the direction the songwriting went in. Pat [O'Brien, guitar] actually wrote a lot on this album. This will be the first album where Pat wrote more songs than anyone else. He's really been super motivated, and he's been writing some great, great material that we're all really excited about. And some of it, it's very evil-sounding stuff. So I think our fans will be very happy. There's nothing on here that's even a million miles close to being a sellout, you know what I mean?! It's definitely full-on evil death metal. I think everyone will enjoy it."